I posted this picture on my fit page a few weeks ago and everyone was begging for the recipe! 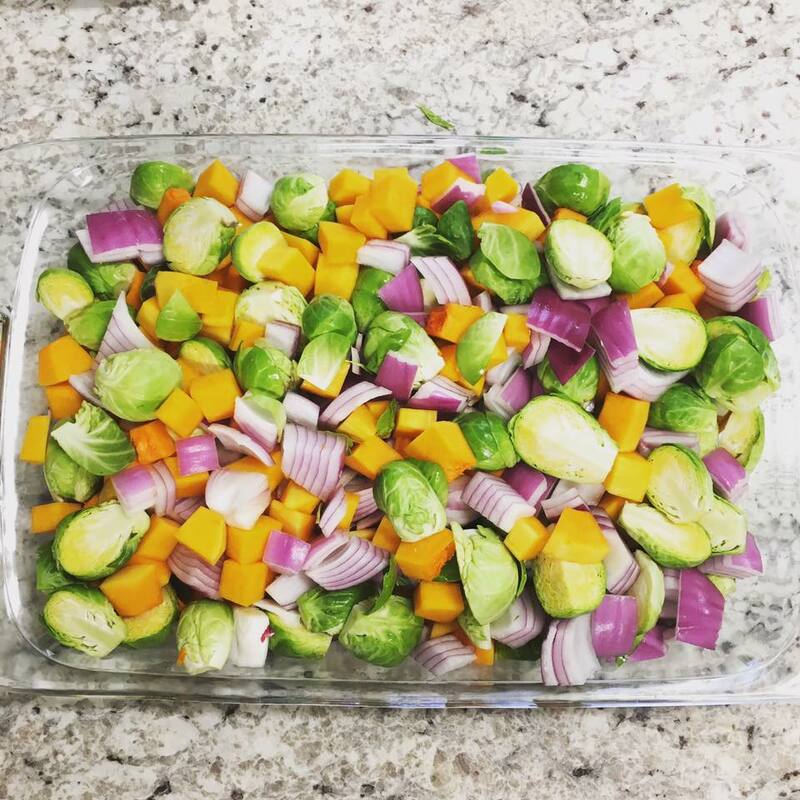 I made Roasted Butternut Squash and Brussel Sprouts to accompany Apple Cider Grilled Pork Chops for a family dinner and this healthy side was a savory hit! This will definitely be going on the rotation. I adapted the recipe from Basil & Bubbly. Place vegetables in prepared dish and toss with olive oil, maple syrup, thyme, salt & pepper. 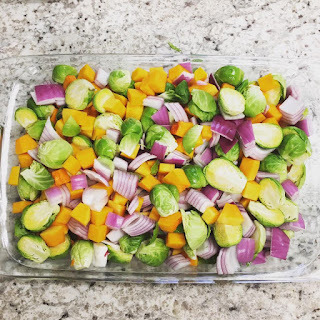 Roast for 20 minutes, toss veggies and then roast for another 20 minutes or until squash & sprouts are tender. 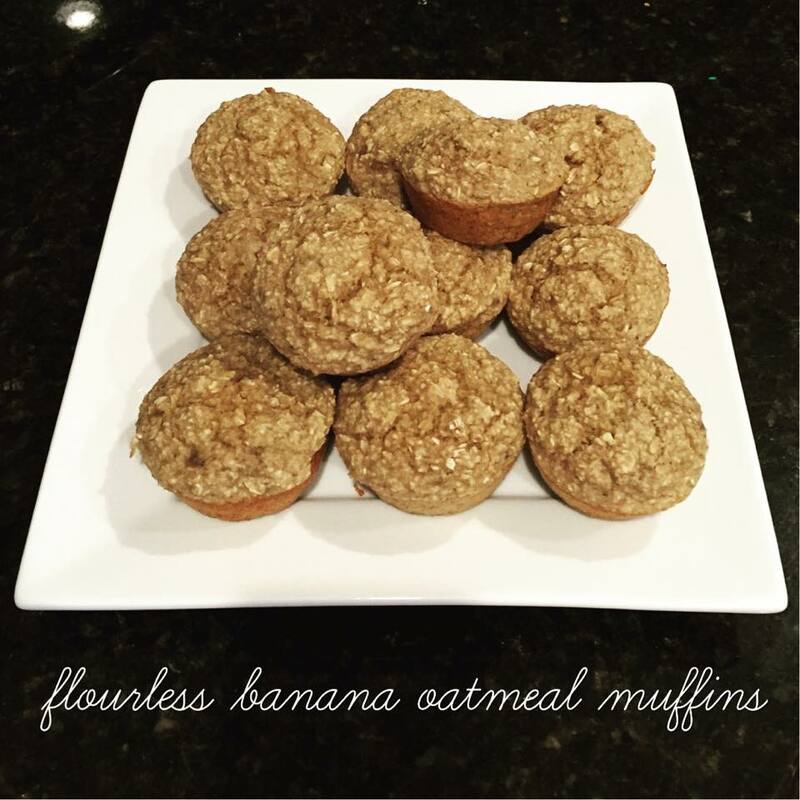 This muffin recipe is EASY and has been a staple in our house since Banks started eating solids. I would make a double batch of these and freeze them for a quick breakfast option in the morning that was healthy! Banks loves them, I love them and they are filled with whole foods!!! I've been meaning to post this recipe for A WHILE now-- so here it is FINALLY! 2. Place the oats in the food processor and pulse for about 10 seconds until fine. Add remaining ingredients to the food processor (if large enough) OR a mixing bowl. 3. Process or blend until everything is mixed together and oats are smooth. Buffalo Chicken, Sweet Potato & Carrot Bake! It's #foodiefriday and this recipe is just TO YUMMY not to share! Had this for dinner Tuesday and the whole family went back for seconds! -In a large bowl, combine together the olive oil, paprika, garlic powder, hot sauce, and season with pepper to taste. 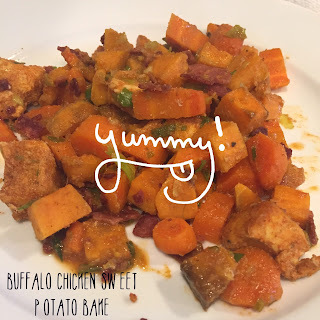 -Add the sweet potatoes, carrots and chicken; stir to coat. -Empty the bowl into a prepared 9 x 13 casserole dish. -Bake in the oven for 40 to 45 minutes, stirring every 15 minutes. -Add the green onions and bacon to the dish and place back in the oven for another 5 minutes to let all the flavors combine. Makes around 8 servings (1 cup each). 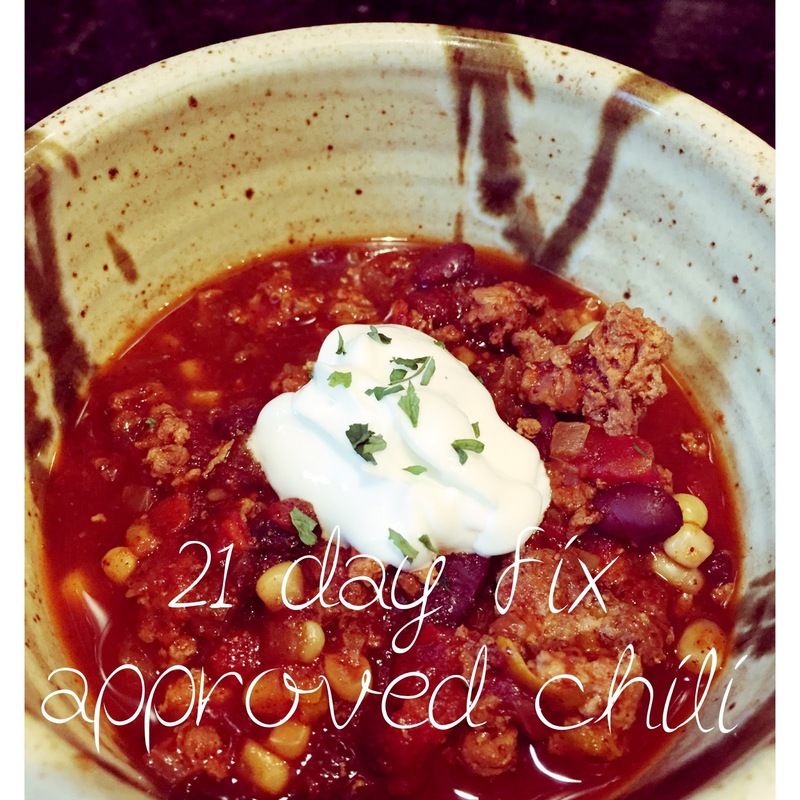 For ‪#‎tastytuesday‬ I want to share one of my favorite "clean" AND easy recipes that is 21 Day Fix Approved! I have adapted this recipe a bit from FITs Simple! 1. Cook turkey (or chicken), onion, bell pepper, and garlic in medium nonstick skillet over medium heat, stirring frequently, 4 to 5 minutes, or until meat browns. 3. Optional: Add a dollop of plain greek yogurt and top with green onions before serving. In a food processor place garlic, basil, olive oil, vinegar and water- pulse until mixture is puréed. 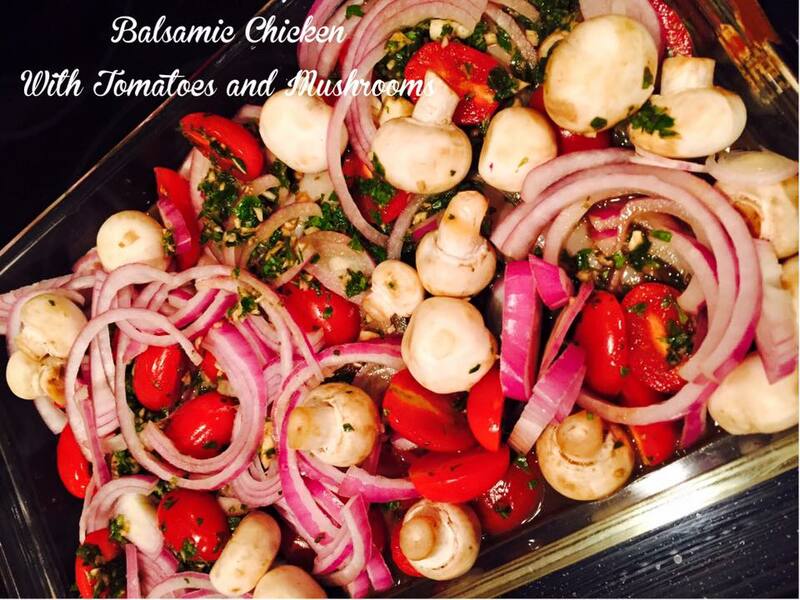 Place chicken breasts in a prepared Pyrex dish and cover with garlic/basil mixture. Top with mushrooms, onions and tomatoes. Bake for about 35-40 minutes or until chicken is fully cooked. Serve with brown rice or a salad. Who doesn't love a recipe that is QUICK, EASY, NO MESS and a FAMILY PLEASER?? 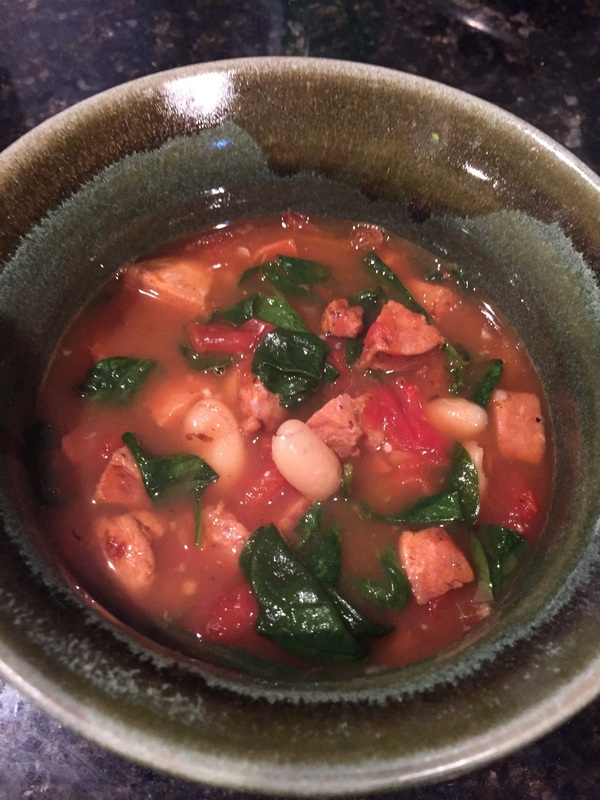 My sister shared this recipe a while back and it is one of my favorites by far! I always seem to have the ingredients on hand so I can whip it up fast after work and the family loves it! 2- Stir in the garlic and cook for 2 minutes more. 3- Add beans, broth and tomatoes (and their liquid) and bring to boil. 4- Add kale of spinach and sea salt & pepper to taste. Simmer, stirring occasionally until wilted, 2 to 3 minutes. Once again I hit the produce department at the right time this weekend and got 2 bunches of asparagus for $1! I am pretty sure I have never bought asparagus before because the hubs isn't a fan-- but I love it, so I wanted to make some for myself! 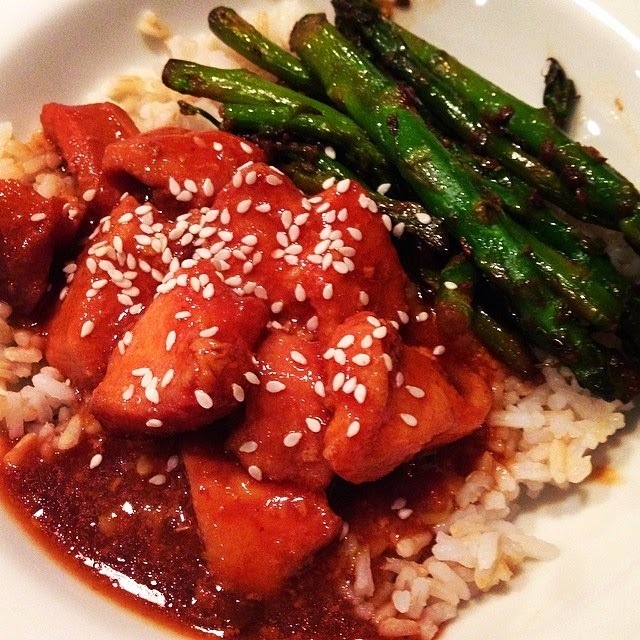 We were having Sesame Chicken for dinner... so I figured a Teriyaki sauce on the asparagus would compliment the main dish! Wash & Trim the ends of asparagus. Once asparagus is done, drizzle with 2 tsp teriyaki sauce and toss.